Fair Winds Press, 9781592334032, 512pp. Looking for more variety in your vegan cooking? Maybe a new type of muffin to make? Or perhaps a pasta or savory pie that’s “just a little different,” but full of flavor and taste? 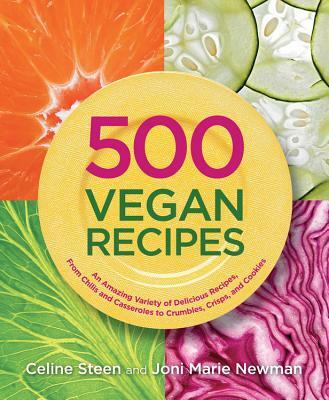 500 Vegan Recipes gives you the array of dishes you’ve been searching for, while still including all your favorite comfort foods and traditional fare. It’s everything you’ve been looking for in a cookbook, and will be a staple reference in your kitchen for years to come. Vegans and non-vegans alike can satisfy their every craving with the recipes inside, which feature international cuisines such as Indian and Cajun, as well as hearty main courses, sinful desserts, and comforting soups and breads. Individual recipes are also marked with such distinctions as Soy Free, Gluten Free, Low Fat, and Under 30 Minutes.